G.H. Clark, Jr., Contractors, Inc. Comment: Large above-ground screened porch with 8 large screened section, plus four smaller ones that may not need replacement. 2 of the 8 border the outside deck and thus are easily accessed; I replaced those two screens 4 years ago. But the other 6 are off the edge of the porch, about 10 feet off the ground at the bottom / 18 feet above ground at the top. I do not have a large enough ladder to attempt this, plus it seems difficult to consider doing from a simple step ladder. Comment: replace 18 windows a front door and a sliding glass patio door. Comment: I need new windows to replace several old worn-out windows in my home office and bedroom. The current windows are poorly insulated and causing the rooms to be very hot or cold. County Roofing and Siding Co.
Rockville Window Replacement Companies are rated 4.65 out of 5 based on 5,079 reviews of 54 pros. 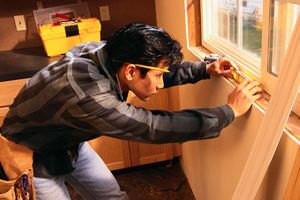 Not Looking for Windows Contractors in Rockville, MD?